Well, we just completed our first week (ever) of Challenge A. I am so excited I can barely contain myself. Six years ago, when I learned about Classical Conversations, it was the Challenge program that I was truly in love with. Attend the parent meetings – this is totally necessary! Whatever you do, you won’t want to miss the parent meetings. You will learn how the class is set up, how to set up your child’s notebooks, how to use the Challenge Guide, and much more. Set up the Student Notebook – your Director will have some great ideas and suggestions about how to set up your child’s notebooks and school supplies. We found a great way that works for us. To check out what we did, click here. It’s important that whatever you decide to do, your child needs to know where his/her things are and how they are organized so they can find everything quickly. Get your supplies together – Besides your required curriculum books and the student notebook/binders and your Challenge Guide (which you get from your Director), you’ll want to have basic school supplies (like paper, pencils, highlighters). You also want to have a TON of index cards, post-it tabs like these are helpful, tracing paper, drawing paper, and rings to put your index cards on also help. You might also want good quality colored pencils and/or fine tip markers or sharpies for the science drawings. Pregame Huddle – Anytime you start something new, it’s important to sit down and look through everything. Take time to sit with your child and show them everything. Explain the Guide, where to find things (it helps to tab the guide if you’re not going to copy it and put it inside their binder), and how to know what their assignments are. Talk through what a week will be like and what to expect. Our community day is Monday, so beginning on Tuesday, we sat down to go over his week. Tuesday morning was our little conference meeting. We talked about what they did during class the day before and I asked if there was anything that he needed that he didn’t have (just to be sure). Then I went though each subject/seminar and looked over his class notes and handouts that the Director gave him. I had him explain what they did in class. Then we looked at the Week 1 page in his Challenge Guide. He looked over his assignments and planned out each day of the week by breaking up the assignments into smaller tasks. His goal, of course, was to get it all done by Friday…and that Friday would be a relaxed day. With that in mind, he assigned more things on Tuesday-Thursday than on Friday. Once he had his week laid out, we worked on his note cards. There are note cards (flash cards) that need to be made for 3 subjects: Geography Terms, Latin, Catechism questions. I neatly wrote the fronts of his cards and he wrote the backs. Don’t get caught up in the note cards. They are assigned so they can be a TOOL for your child to use to help them memorize their work. The actual act of making note cards is not as important to me. If your child has poor handwriting or is bogged down in other work, I believe it’s okay to help with this task. They could also type them and cut out, or just use Quizlet. Again, the focus is on memorizing the material. Once that was accomplished, the set out to complete the tasks he assigned himself. I do suggest that they start with the hardest subject/task or the subject they like the least. I was ready for my son to be frustrated or exhausted every day. I was bracing myself for a fight to do his work. I really felt like we would be working 6+ hours a day because that’s what I was told! The reality is that he gets started about 10:30 am and works till 3:30. During that time he ate lunch at some point. I’ve looked ahead and I don’t think that this will ever take longer than that (except maybe on the Elocution week of writing). Well, that depends. Every child is different and every family situation is different. A child that works independently will be better off than a child who needs you to help all the time. I know we all want to brag about our kids, but in all honesty, my son is an average learner. He is not ahead nor is he behind. He doesn’t work super fast and he doesn’t work super slow. Sometimes I have to sit next to him and keep him on task, and other times I can send him with his assignment and he’ll do it on his own just fine. I’ve spent about 2/3 of the time with/near him this week. He does his work next to me except for reading and sometimes math. If you have a hard first week, don’t give up! Every child will eventually get to the point of independence eventually! It might take longer for some. The main goal of Challenge A is to help your child get to that point! Call your Director and ask for help or advice. If your Director has been a director before, then they have probably had experience with all sorts of struggles and triumphs and can offer help. 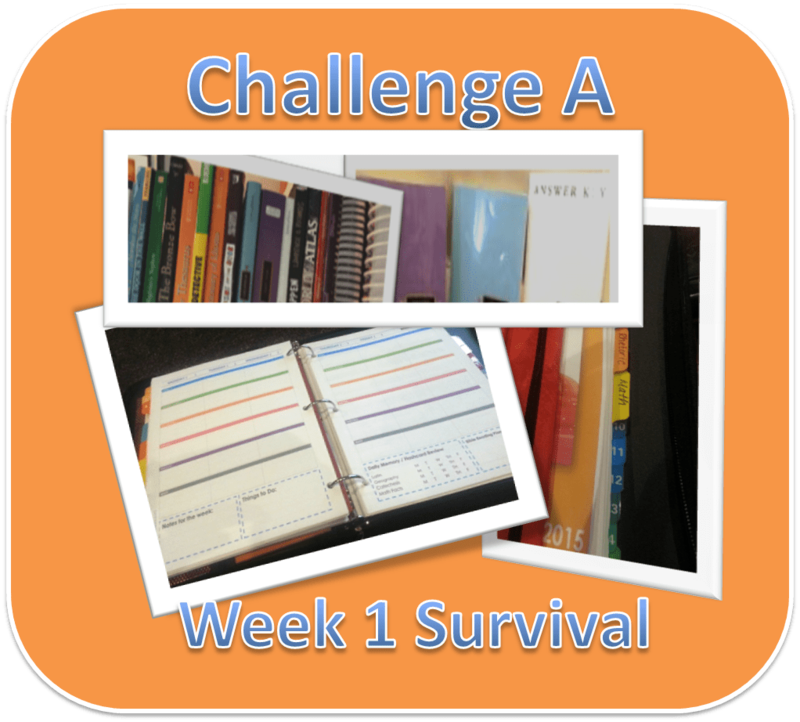 For help on planning, check out my Challenge A Student Planner as well as how we set up our Student Notebooks. I am certainly not an expert on Challenge A and we’ve only made it through one week…so I will keep updating as we come across any challenging times and share any great ideas that we get along the way! We are now onto Week 2 and hopefully our “bubble” won’t pop! I highly anticipate having a great 2nd week and beyond. I believe, like anything, as long as we stay consistent, we will be fine. Anyone have some great Challenge advice? Actually, you will be surprised, the elocution week is the quickest! The first essay will almost make you cringe bc it’s so simplistic. Thank you for posting on Challenge A. I have a Chall A daughter who is doing overall well, but I long to hear from other Challenge A moms and how they are doing. We have a small class (2 people) and a wonderful tutor. We are enjoying it so far (week 4 so far). My daughter is just starting to settle into the work load, but now that LTW’s assignments are a little more involved, she has had to adjust to that. Overall, going well. Thank you again for sharing your experiences, the planners, etc.